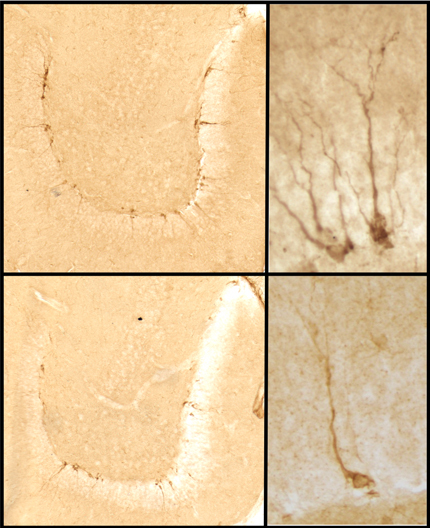 Images in the bottom panel show mice treated with the chemotherapy drug: growth of new cells (brown) is reduced. A chemotherapy drug used to treat brain cancer may increase vulnerability to depression by stopping new brain cells from growing, according to a new King’s College London study out today in Translational Psychiatry. In their new study, scientists from King’s College London set out to examine whether the effects of chemotherapy on neurogenesis could alter biological brain mechanisms which increase vulnerability for depression. They administered a chemotherapy drug to mice called Temozolomide (TMZ), using the same procedure that human patients would experience in a clinic. Mice receiving the chemotherapy drug showed a significant reduction in growth of new brain cells in the hippocampus – a region associated with emotion and memory. Results from the study show that the more the drug decreased neurogenesis, the greater the increase in stress hormones when exposed to stress. When researchers looked at the mice’s behaviour following treatment, they observed several changes related to depression, including robust deficits in novelty processing and a decrease in preference for a rewarding sugar solution. A lack of pleasure seeking, as observed in mice that received the chemotherapy drug, is a core diagnostic symptom of depression. Dr Martin Egeland, first author of the study, from the Institute of Psychiatry, Psychology & Neuroscience (IoPPN) at King’s College London, said: ‘Although these preliminary findings are based on mice, our results suggest that chemotherapy may stunt the growth of new brain cells, which has biological and behavioural consequences that may leave people less able to cope with the stress of having cancer. Dr Sandrine Thuret, senior author of the study also from the IoPPN at King’s College London, said: ‘Our study highlights the importance of protecting brain stem cells or building up a reserve of cells before cancer treatment. This could help to preserve the mood and cognitive functions these cells are known to regulate, and could also improve quality of life for people with cancer.